Another Summer Saturday...another road trip to the water park with Happy Meal...another cheeseburger. This time it was Farmer Boys in Rubidoux, CA. 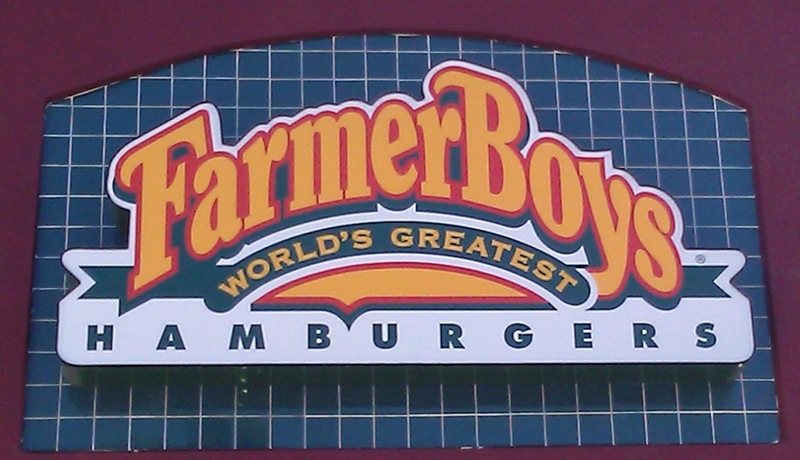 Besides, Farmer Boys boasted that they sold the World's Greatest Hamburgers (TM)...yes, they trademarked that phrase. It took some serious clankers to make that sort of claim, and Sheriff Happy Meal and I were there to ensure that this bold statement was warranted. Parking was readily available in the attached lot. We ordered our cheeseburgers at the counter--a double for Happy Meal and The Natural for myself. We found seating and settled in for a brief, 5-minute wait as our burgers sizzled on the flat-top. The Beef: Farmer Boys was a 69-unit franchise, so it was safe to assume that the Chuck arrived pre-ground from a centralized distributor. The beef was coarsely ground. It was about 20% fat, but it was not greasy at all. The beef was nicely juicy. 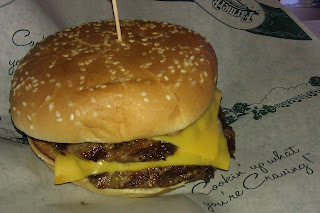 The 1/3 pound patty of The Natural was substantially similar to the 1/4 pound patties in Happy Meal's double cheeseburger. In both cases, the beef was mildly beefy. The burgers both lacked any real complexity in terms of aging or mineral notes. The beef was fine, average, OK, ordinary. The Seasoning: The burgers were lightly salted as they cooked. These burgers needed a little more help than this smattering of seasoning if Farmer Boys really hoped to live up to their bold catch phrase. The Sear: The burgers were smashed on an adequately hot griddle, but the sear was unremarkable. The Preparation: The burgers at Farmer Boys were flattened to order as they cooked. The burgers were cooked to a juicy Well-Done. The Cheese: This was the high note of the dish. The Natural came with two slices of American cheese. While the American cheese sort of voided out the concept of naturalness, it certainly did reinforce the concept of cheesy deliciousness. The cheese was thick, creamy, gooey, savory, and all of the other good things that we have come to know and love about American cheese. The same could be said for the cheese on the double cheeseburger that Happy Meal worked over. I managed to taste only a sliver of his burger before he promised me lasting physical damage. 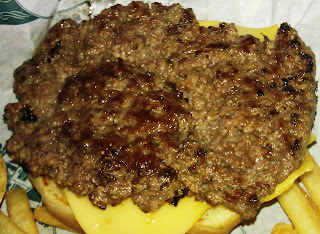 The Bun: Farmer Boys served the burgers on fresh, but barely toasted, potato buns. The buns were very nearly flavorless. However, the buns were moist and just chewy enough. The buns were adequate. 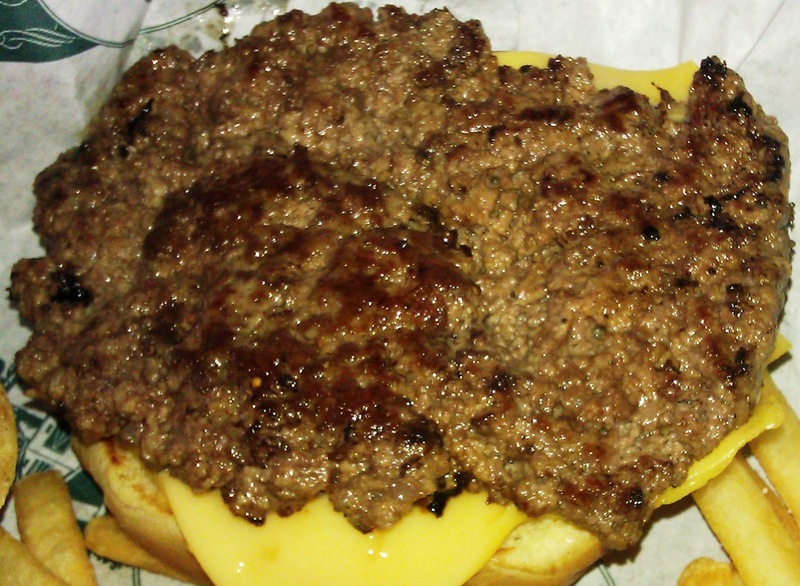 The Meat To Bun Ratio: Flawless. The Toppings: I requested no toppings. The Fries: The peel-off, previously-frozen, par-cooked fries were perfectly crisped and served hot. The fries at Farmer Boys were under-salted, but we remedied that at the table. The Value: We dropped $16.44 on two cheeseburgers, an order of fries, a small shake, and a soft drink. Neither of us could finish our food. The flavor was average, and the portions were generous. The value was fine. 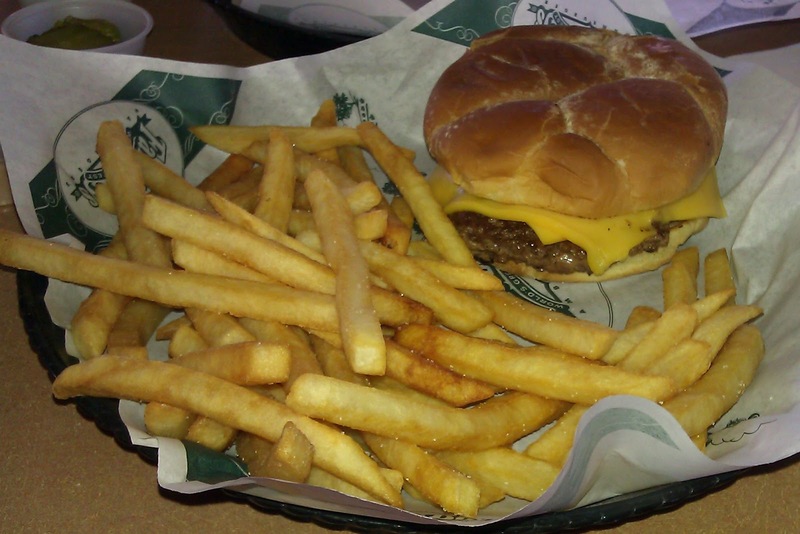 The cheeseburgers are Farmer Boys were pretty darned far from best the world's greatest. The burgers were average in terms of flavor. The quality of ingredients was high, but the flavor just wasn't there. Burger Review : Average tasting burgers at a fair price. Editor's Note: At the time that I wrote this review, Olympic women's beach volleyball was on. Rather than the bikinis that I had come to view as my right to enjoy, the women were sporting full-length tights. This was a sad day for the sport--this was a sadder day for me. Either the uniforms have to change back, or beach volleyball gets taken off the roster of Olympic events. It was simply unwatchable and massively disappointing. All that I could think about was how horribly hot and uncomfortable those poor girls must have been. Can you please review the burger at the Roof on Wilshire. Seriously the worse burger EVER. And someone needs to say so to celerity chef Eric Greenspan. Don't worry -- the women's sand volleyball uniforms were tights only because of the rain and chill. If the weather improves, so will the outfits.